What a bizarre month yet AGAIN! , Surf at Bogue Pier ranged from a low of 42° to an unexpected high of 60° with an average of 50.4° (blue diamonds). Bogue Sound had a low of 40° and a high of 68 (yikes)° with an average of 54.3° (red squares). Wild fluctuations indeed with a slope of the fitted line you see in the graph of the surf temps of almost 0.5°/day. What a strange winter! Remember the average surf for this past January was 44.8 and for the sound 41.0. 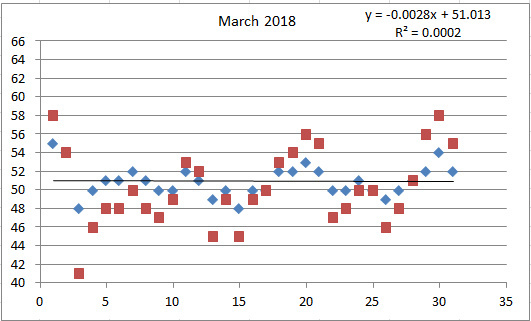 UPDATE for 2/23/18: As most of you know, I, the consummate scientist, have religiously taken water temperatures for well over 20 years. Why? It tells us who and when as far as the comings and goings of fish on our local waters. In the winter it also can raise flags as to the safety of some of our favorite commercial and recreational species, specifically the speckled trout who are known to be susceptible to cold water temperatures. Speckled trout are a warm water fish are the cold spells as we have experienced recently can lead to so called “cold stun” events or as I call them…troutsicles! 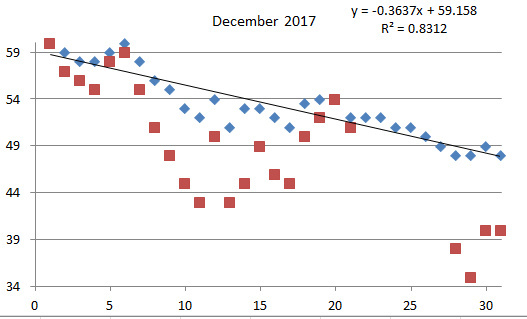 In fact over the years as I have amassed reams of water temperature date, we have also documented such trout kill/stun events every two to three years. 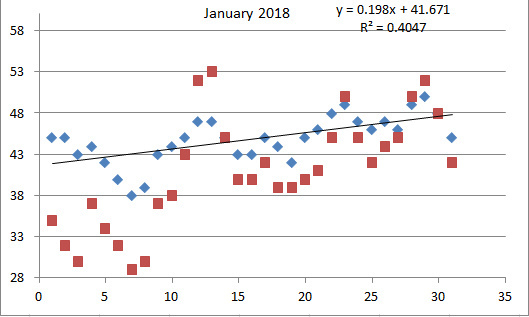 This past week I measured surf temperatures at Bogue Pier as low as 38-degrees (Fahrenheit) and as low as 29 and 30-degrees in the ice and slush of Bogue Sound. The last time I saw water temperatures reaching these lows were in late January 2003, after a snow event and freeze which led to a very significant trout kill. In late December 2010 into early January of 2011 we had a series of cold events that were extreme enough for our NC Department of Marine Fisheries close all harvest of speckled trout and adjust both bag and size limits for when the season reopened. More recently new cold stun guidelines have been put in place to, on a regional basis address the issues of cold stun events with speckled trout. These guidelines based on experimentally validated water temperature criteria and visual cold stun parameters of affected fish, were instituted for the first time this past week in response to the extreme weather conditions. This proclamation closes the commercial and recreational spotted seatrout fishery due to cold stun events, in accordance with the management strategy outlined in the N.C. Spotted Seatrout Fishery Management Plan. The spotted seatrout fishery will open June 15, 2018 by proclamation. 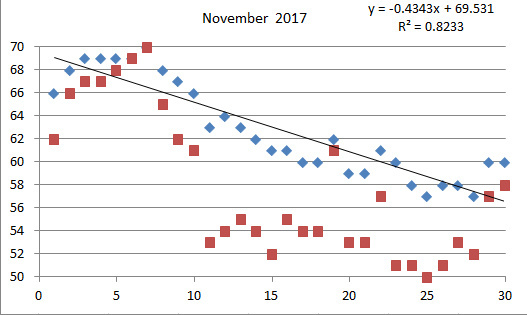 So how wide was the scope of this year’s cold stun event? Locally we have heard of stunned and dead trout numbering in the hundreds in fish in the North River and at least 1000 estimated in the White Oak River near the train trestle around Stella, Gayle’s Creek, Pungo River and there were also stunned fish reported as far north as Kitty Hawk Bay and as far south as Surf City. There were also reports of trout kills in Virginia. Indeed a wide ranging situation. Also remember the number of floating fish, that initially lost equilibrium doesn’t account for the many that remain on the bottom unseen. The NCDMF may do some bottom trawl surveys to get a better handle on the total numbers. Other fish killed? Visual confirmed reports were of red and black drum, flounder mullet and probably more. And please remember, during this closure NO possession of spotted sea trout is allowed from fishing or scooping up of dying or dead fish. I repeat NO possession of speckled trout is allowed until the closure is ended by proclamation, presumably on June 15, 2018 by our new Director of Marine Fisheries, Steve Murphey. Steve was recently appointed to take place of the interim director Braxton Davis who will return to his full-time role as director of Coastal Management. 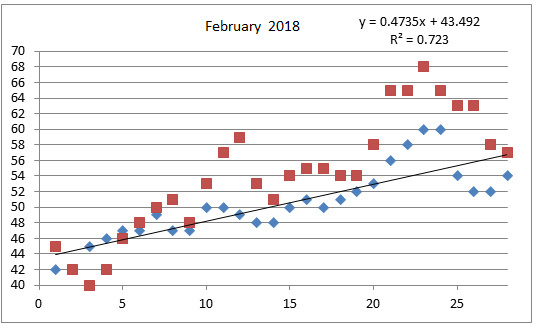 What a bizarre and frigid month, surf at Bogue Pier ranged from high of 50° to a low of 38° with an average of 44.8° (blue diamonds). Bogue Sound had a high of 52° a trout (and other fish) killing low of 29° with an average of 41.0° (red squares). This January was one of the coldest I’ve measured in my 25 years here in Emerald Isle, even colder than 2003. The coldest days were early in the month so we actually saw an increase as the month went on. In addition we had a super, blue, blood moon and an eclipse and king tides. Trout kill was from northern part of the state to Surf City to the south, and the season is closed until mid June by proclamation. Surf at Bogue Pier ranged from high of 60° to a low of 48° with an average of 53.3° (blue diamonds). Bogue Sound had a high of 60° a low of 35° with an average of 49.0° (red squares). December was a month that started normally then dropped a bit below normal and remained so throughout the month. Temperatures dropped by about 0.36°/day for the month. For the year we averaged 66.7° +/- 10.9°, so despite unusually warm temps through the 4th of july (including a 66° blockbuster in late February) and below normal from July to the end of the year, 2017 averaged absolutely normal. Go figure! Surf at Bogue Pier ranged from high of 70° to a low of 57° with an average of 62.8° (blue diamonds). Bogue Sound had a high of 70° a low of 50° with an average of 57.8° (red squares). November was a month that started normally then the temps went in free fall after a few cold fronts. Temperatures dropped by about 0.43°/day for the month. Surf at Bogue Pier ranged from high of 77° to a low of 66° with an average of 72.9° (blue diamonds). Bogue Sound had a high of 79° a low of 57° with an average of 69.8° (red squares). 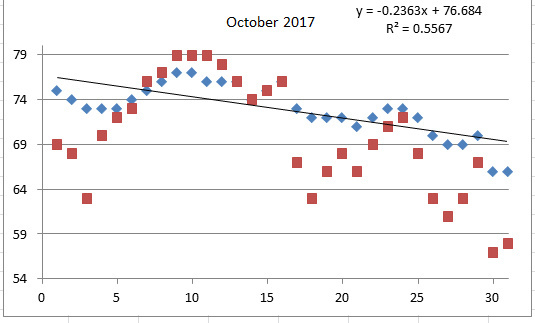 This October had a few ups and downs but was basically a normal October profile of decreasing temperatures, about -0.25 degrees/day. Surf at Bogue Pier ranged from Low of 74° to a high of 81° with an average of 77.3° (blue diamonds). Bogue Sound had a low of 68° a high of 81° with an average of 76.6° (red squares). 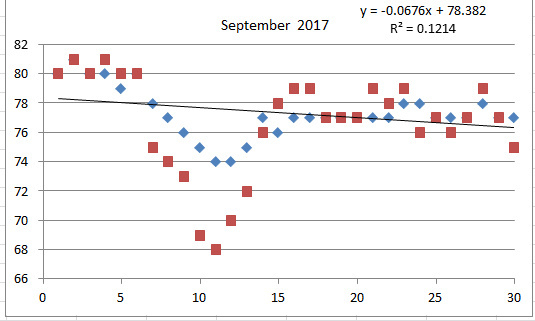 September temperatures were nearly flat with a slight downward trend with most of the month running near or below normal. In fact the temperatures were strangely invariant with 20 of the 30 days being 77° +/- 1° for the month. and that despite fairly warm weather, the surf temperatures were consistently below normal which would average about 80° for the month. And that’s after warm winter and spring temperatures. On the radio show, I basically spent the month of August talking about flounder, where and how to catch them and also spent a show on cooking flounder. So I wanted to conclude the flounder discussion with issues of biology, stock health and past and current regulations, so I invited Mike Loeffler, stationed in Elizabeth City for that discussion. In the transcript below, Ben Ball, host of Coastal Daybreak is designated as BB:, Mike Loeffler, ML: and I’m the questioner in italics without designation. ML: I’ve got a degree from Texas A&M University in Marine Biology. I’ve been with the NC Division of Marine Fisheries for 17-years. I’ve worked on a variety of species. I’ve been on flounder the last couple of years. I’ve also been the species lead for Atlantic and short-nose sturgeon for about 13 years, I did a short stint with spotted sea trout, with weakfish, I was species lead for white perch, yellow perch and our catfish fishery up in the Albemarle Sound area. That was a good variety over the years. With flounder as Ben mentioned, we finally coalesced the regulations. So what are the species of flounder that we normally see here and how do we tell the difference…not that we have to for the regulations, but there are differences. We have a number of different kinds of flounder and they are different species. ML: There are, in total there are about 267 or so flounders in the coastal waters, but in North Carolina the commercially and recreationally important species would be the summer flounder, the Gulf flounder and the southern flounder. We have two of them that have oscillated spots so they have a dark spot with a white ring around them, those would be your summer flounder and your Gulf flounder. And those you can distinguish the difference based on those spots. So the summer flounder (http://portal.ncdenr.org/web/mf/flounder_summer) have two spots on their tail and one a little bit farther up on their mid-body and it creates a triangle and that triangle points towards their head. The Gulf flounder (http://portal.ncdenr.org/web/mf/flounder_gulf) are the opposite, they have one oscillated spot on their tail and have two mid-body and the triangle points towards their tail. The southern flounder (http://portal.ncdenr.org/web/mf/flounder_southern) of course they don’t have any oscillated spots. They are the other ones. One thing that they are I tell people that they are “left handed” flounder, why’s that? ML: That’s correct, they’re “left eyed” flounder, and that‘s because during metamorphosis that are hatched just like any other normal fish, eyes on both sides of their head, and just a few days after hatching their right eye begins to migrate onto their left side of the body and then soon they lay down flat. So when they come through the inlets and estuaries, when they settle out they look just like the flounder that you catch today. I occasionally make fish prints of flounder and when I do that, of course they are the mirror image so they come out to be “right handed” flounder. ML: That’s right and there are some…the is an instance we do see a few “right handed” southern flounder and there are a lot of varieties of “right handed” flounder as well, but typically those are more northern species. We don’t see too many “right handed” flounders down here. I know when I lived up in the cold white north I used to fish for something called winter flounder and they have no teeth and are “right handed”. ML: Right. And their biology is a little bit different. The winter flounder come inshore to spawn instead of going offshore to spawn, so there is a slight difference in their biology. What are the differences in habitat for these three kinds of flounder, where do we find them? ML: They kind of spread themselves out when they are in the estuarine system, they all spawn offshore in the winter time, the larvae all get blown into the inlets throughout the winter and spring. Then they settle out and they kind of segregate themselves once they settle out. The winds and currents push them, but based on their maturity when they are growing up as larval fish they settle out at different rates. The southern flounder typically go farther upstream than the Gulf and the summer flounder. So you’ll see those up in the Pamlico River you’ll see them up in the Albemarle the more freshwater systems. They’ll tolerate salinities less than 10-parts/thousand (ppt) whereas the Gulf flounder, they are kind of in the mid-range they will settle out in the 15 to 20-ppt and the summer flounder settle out more in the higher salinity waters so closer to the inlets. BB: So do you catch them more in the ocean? ML: Typically you see more summer flounder in the ocean. If you see the summers inshore they are typically right near the inlets. They tolerate the salt water a whole lot better at a much younger age. But you will see summer flounder, Gulf flounder and southern flounder all in very similar areas. Over the years what is the stock assessment of our flounder populations here in NC? Up? Down? Staying about the same? Different species changing differently? ML: They do change differently, summer flounder for instance they were more depleted back in the early 1990s…they’ve had a pretty good recovery. Our spawning stock biomass is still above the threshold so they are not over-fished although over-fishing is occurring on the summer flounder stock which is why we have had to implement the reduced recreational creel bag limit to four fish to bring that fishery mortality rate down. Southern flounder that’s a bit of a different story, we’ve been doing stock assessments since the early 2000s on southern flounder. Our most recent one in 2014 didn’t pass peer review so we’re technically still managing under our 2008 assessment and at that time it was over-fished and over-fishing was occurring. Based on some of the peer reviewers’ comments from the last assessment in 2014 we’re trying to address all those comments, like the migratory nature of the southern flounder. So we’ve put a group together of scientists from Louisiana State University, from UNC Wilmington, our Division Staff and we have representatives from the states of South Carolina, Georgia and Florida and we’re working through a new assessment as we speak. You’ve mentioned the summer, Gulf and southern flounder have different ranges. What do the ranges look like particularly of the Gulf and summer flounder and do you see any changes in the distribution…any obvious effects of climate change or water warming or anything with those species? ML: So the southern flounder and the Gulf flounder they are typically from North Carolina south through the Gulf of Mexico. Summer flounder, they go all the way to Florida, but the population center is around Cape Hatteras and north, so they distribute themselves north versus south. You have different growth rates, those summer flounders that live in the more temperate waters or colder waters up north typically live longer and grow bigger than our southern flounder or Gulf flounder. As far as changes, as water temperatures increase you’re likely to see southern flounder mover further up the coast. We’ve had reports of southern flounder in the Chesapeake Bay and a couple of juveniles found in the Delaware Bay which is very atypical. Now the question is are the waters warm enough for those fish to survive through the wintertime to mature and get back into the migratory reproductive stage in the ocean. It’s probably unlikely at this time, and of course as the temperatures increase, if they do continue to increase, they those summer flounder we’ll the movement of those fish further north because they don’t tolerate the hot water as well as those other species. I’ve seen with some other species…I’ve lived in the northeast and I’ve also lived in the Delaware area, and when I lived there I really didn’t…I saw summer flounder of course, but I never caught red drum, I never caught speckled trout, but these days I know there are friends of mine up that way who now can actually target them at this time. That looks like a shift in the population of those species to the north. ML: We see that, where we are in the mid-Atlantic here we’re kind of at the crossover between the warm water fish and the cool water fish. So as those temperatures warm up our more southern fish will definitely be caught further up north and we see the same thing with weakfish as well. You can go up to the Cape (Cod) where they typically didn’t see weakfish now there is a significant recreational weakfish fishery for weakfish. Again seeing those water temperatures and those fish moving further north. Another pattern that seems to have changed over the years, and I get this not only from my own fishing but also from many of the local fishing guides, that the summer flounder…I’ve had a hard time catching them along the beach, from the surf and around the piers over the past number of years and a lot of the guides really target them now…their best bite is out at the nearshore reefs and wrecks. From the artificial reefs and rock ledges and this is in the summertime not the wintertime bite, like AR 315 and 320, these inshore reefs all the way out to Southeast Bottoms and Northwest Places. Is that something others have noticed as well? ML: Yes they have and what they are keying on is they are finding those structures where the bait fishes are. Those species of flounder, the summer flounder and the Gulf flounder they like more of a hard sandy bottom and they’re going to find somewhere around structure where the bait fish tend to congregate. Whereas your southern flounder, they’re more of a silt, organic rich, mud type bottom, so they don’t typically find themselves around those structures. They will in inshore waters, but they don’t like the hard sandy bottoms like the summers and the Gulfs. There are several reasons why that could have happened; it could be for the bait species moving offshore or the fact that we have such a good artificial reef system here in North Carolina that that’s encouraging them to stay longer on those offshore reefs because their habitat is changing. BB: With every restaurant it’s Location, location, location. ML: The division has been putting a lot of work and a lot of effort into updating those artificial reefs and of course as we know the longer those reefs are in the water the more bio-fouling that’s on those reefs, the more that attracts those bait fish. So the longer that those reefs are in the system the more that they are going to attract those species. Let’s finish up with some of the current regulations and how we got to where we are. Last week I had one of the sheets I printed out from 2010 and I was going through what the regs were for a number of species including flounder. I was very complicated in 2010! Where are we now and how did we get there. ML: Well right now we are at a 15-inch minimum size limit for recreational and commercial fishermen inshore. We got here through a variety of actions, back to the original one with an 11-inch minimum size limit back in 1979, they we went up to a 13-inch size limit in the 1980s, then to a 14-inch size limit after the 2005 assessment and then due to some requirements through the mid-Atlantic and ASMFC we had a 15-inch size limit in the ocean…some areas we had a 15 ½ -inch limit some areas we had a 14-inch size limit. That gets very confusing depending which management agency was responsible. So we kind of got away from all that so right now the 15-inches we enacted that for recreational and commercially in 2016. So everybody’s on the same page in inshore waters. Where does that seem to be going? The way the stocks are now is that going to be stable for a while, 15-inches, 4-fish and we don’t have to work about where we are? ML: I think we’re going to have a lot of discussion once the results of our current stock assessment come out. ML: We’re hoping, where trying to get that out before the MFC meeting in November. But we have had some issues, we’re trying to make sure we cross all of our “Ts” and dot all of our “Is” so we may have to delay that until February. Just have to make sure have a prudent stock assessment to go forward to the public, so by early spring at the latest. Through that process, once that’s complete and we see where the status of the stock is, then we will begin our review of fisheries management plan. That’s where we’ll have the discussion on what we need to do to further help the stock or do we stay where we are for a time period. It that stock or stocks that you are doing the stock assessment on? What are you looking at there? ML: What we’re looking at in this assessment is merely southern flounder, but our unit stock for this assessment will be southern flounder located in the waters of North Carolina, South Carolina, Georgia and Florida because of the migration rates we’re seeing in our tagging that our fish are moving south throughout the year. We don’t see many fish come back north, but because it is a mixed stock amongst all those states that’s what we’re moving forward with in this assessment. Surf at Bogue Pier ranged from Low of 77° to a high of 84° with an average of 80.5° (blue diamonds). Bogue Sound had a low of 75° a high of 87° with an average of 80.9° (red squares). 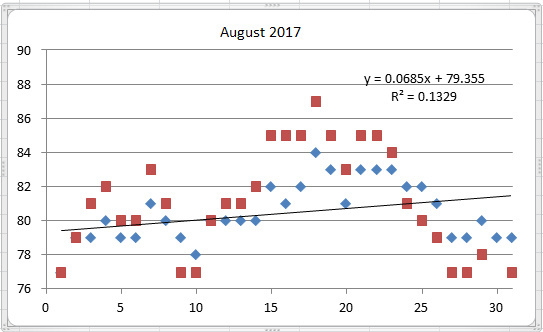 August temperatures were nearly flat with a slight upward trend mid month falling off the last part of the month, with most of the month running near or below normal. Average surf for month of August is around 82°. We also had our first mullet below right on schedule on August 27, with surf at 70°, sound 77°. Average date is August 29 since 1999. The bait along the beach has perked up the fishing.